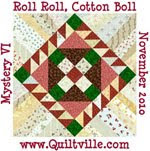 Finished my Roll Roll Cotton Boll. Yea!! the piecing is finished. Now to quilt it. So, there is still work to do. I took today for me. Everyone needs a me day now and then. I really like your colors! I love your border and the rest is fabulous. Hope your me day was a good one. Looks great so far. Show and Tell at retreat, maybe? This quilt is beautiful. 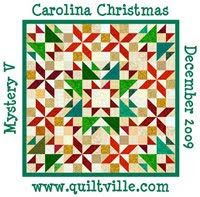 I stumbled onto your blog by searching for tips on the Omigosh quilt. I love yours - I have purchased all of my fabric and just need to start cutting strips. 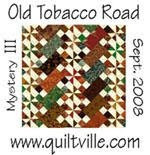 After reading your process thru this quilt I am feeling a mixture between fear and excitement! Just finished quilting mine and put it on a bed today. Always a good feeling to wrap one up.